The Meg’s another summer movie extravaganza that winds up dead in the water. It’s not as funny as it should’ve been. It’s nowhere near as thrilling as it could’ve been. But, at least it’s not quite as bad as Skyscraper. The movie starts with a flashback to 5 years ago and a deep-sea rescue gone bad. 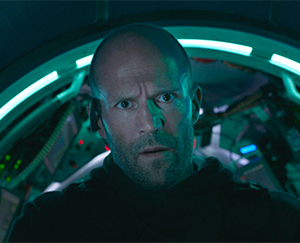 There’s Jason Statham (this time, his character’s name is Jonas Taylor) with his impeccably maintained peach fuzz, attempting to extract a team of scientists from a volatile situation. From a doctor’s point of view, he’s undergone a psychotic break (Jonas, not Jason). Jonas thinks there’s a monster in the deep and he hauls the team out, stranding several colleagues. The underwater-marooned ultimately die in a horrendous explosion. Returning back to the current day, Jonas is still scarred from that incident and he’s retired from the world and turned into a beach bum in Thailand. That peach fuzz hasn’t changed 1-quadrillionth of 1 millimeter. Incredible. A real beach bum would’ve grown that bad boy out to his belly button, but Jonas is, apparently, a higher-class beach bum. Or at least a high-maintenance beach bum with a remarkable grooming budget. In fairness, he does have time on his hands. And — maybe — when you live the life of a beach bum, every day is Day Three. But here’s the problem with The Meg: more words can be spent writing about Jonas/Jason and his amazing monochromatic peach fuzz than about the intricacies and vicissitudes of the movie’s storyline. The really sad (so very sad) part is the movie’s based on a book. Well, no. Not “a” book. There’s a whole flippin’ series of Meg books by Steve Alten. The Meg is a heckuva lot like Skyscraper. Both are tonally adrift. Neither goes for the gusto and commits to either full-on action or self-aware parody. With Skyscraper, the storyline was so cockamamie, it really needed to play out like an action movie spoof, a modern-day Airplane. Similarly, The Meg merely dips its toes into the shallow end of the possibilities and winds up being nothing more than a lukewarm kiddy pool of an overly-safe movie, one that is dwarfed by the full-on water park that is Jaws. Sure, the titular megalodon is a 70-foot, 70,000-pound prehistoric sea monster, but it still can’t craft the thrills of the classic Great White tale. At 43, Jaws, the movie that ushered in the blockbuster era, is still a beast of a summer movie. Anyway, the basic story is very much like Jaws. There’s a big sea monster out there and the unwitting general public is in danger. Once a couple tame underwater missions are completed and the story moves away from a glitzy, brand new $1.3 billion-dollar undersea research lab, the action loosens up a bit and it seems like the movie might actually start to gain some momentum. 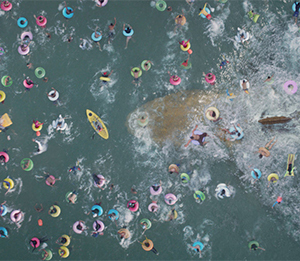 Much like Skyscraper, The Meg throws out a lot of juicy bait that’s ripe for skewering, spoofing and shocking. But at each opportunity, this supposed monster movie shrinks back in a blandly timid fashion. Consider these components and how adjusting their outcomes would’ve made this movie something worth watching and — gasp — talking about. So (mild spoiler warning here, for those who really care), Morris finally gets his comeuppance, but it’s nothing near what he deserved. It should’ve been ghastly. Jaw-dropping. Uneasily entertaining. There are also a couple silly situations in China’s Sanya Bay. One involves a spoiled kid sporting a pool toy and a popsicle. He’s seen flailing about in the commotion as the megalodon approaches. Having just thrown a bit of a temper tantrum, most audience members probably would’ve like to see nothing left of the kid but a floating popsicle stick and a deflated floater. But. No. And then there’s a lap dog who loves to swim. Yeah. It’s a cute millisecond of a moment when the pup sees the megalodon, yelps, and changes course. But. Come on. It winds up being safe as well. So, when The Meg gets an opportunity for vengeance handed it to it like feeding time for a pet, it goes soft. And when The Meg teases thrilling endangerment, it wimps out altogether. As the end credits roll, the movie hits its high-mark. The closing title cards scroll in reverse — from top to bottom. That’s clever. (Hey, “clever” here is merely relative.) And the classic pop tune Mickey is performed by Pim, a Thai artist. Why Mickey? Nobody in the movie is named Mickey. Maybe Jason’s Jonas should’ve been called Mickey. But, nonetheless, the rambunctious rendition seems to carry the tone and spunkiness the movie was intended to have all along. Unfortunately, there’s nothing fine here. And there’s nothing to blow the mind.